Founded in 1988, Muirfield is an established and successful building contractor in Scotland, United Kingdom. Currently they’re building a school (Kingspark School) in Dundee, Scotland. Around 200 employees are contracted to construct the school. 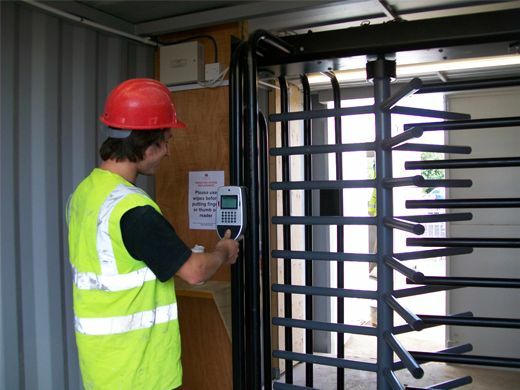 Muirfield required a robust and reliable Time Attendance and Access Control system to manage their employee’s attendance as well as providing a safe environment by preventing unauthorised trespassers accessing the construction site. 2x Jakin ID Fingerprint Model (ACTA-1K-FP) was chosen for the site. Jakin ID units uses built in relays which controls the HEET turnstiles to access the site. Jakin ID units are IP 65 Certified certification for resistance of environmental elements for outdoor installation. Biometric Fingerprint technology prevents problems of “Buddy Punching” where employees may pass on their ID’s to clock in despite not being present on the site. Jakin ID TA software deployed allowed senior managers to quickly analyse employee’s attendance records and punctuality as well as and generating reports from the terminal. Muirfield did initially ran into some problems with the installation in the early phase. But this was quickly resolved by Jakin ID’s dedicated technical support team by providing an engineer onsite to quickly troubleshoot the misplaced wiring to correct the fault. He also provided advice on best practices to use the Jakin ID efficiently. Muirfield was impressed by the features that the Jakin ID Fingerprint Model & Jakin ID TA solution provided and have praised the dedicated support team to help them on their enquiries, which lead them to highly recommend Jakin ID for cleints that work in similar industries.